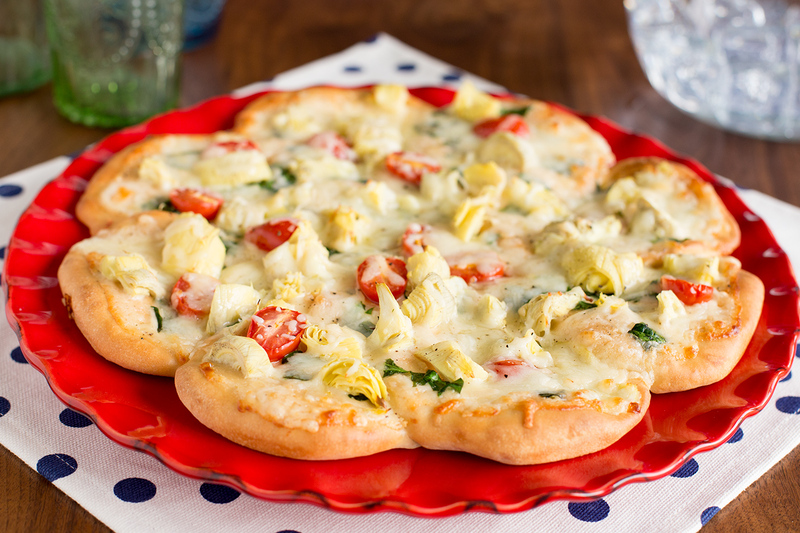 Anything tastes better with cheese and garlic on it and this slight variation pizza recipe is proof. Flatten each roll into a 3-inch circle. Place one in the center of a sprayed 12-inch pizza pan. Place remaining rolls in a circle around the center one overlapping each one about 1/2-inch. Bake at 375 degrees F 10 minutes. Combine softened butter, garlic powder and parsley flakes. Spread over cooled crust. Sprinkle with Parmesan and artichokes. Cover with grated cheeses and sprinkle with pepper. Bake at 375 degrees F an additional 10-15 minutes or until cheese is nicely melted.